With new Veet Sensitive Touch Electric Trimmer, you can now easily achieve the precise look you always wished for. It quickly and gently cuts and shapes your hair on sensitive and delicate body areas such as face, bikini lines, and underarms. Its compact size makes it easy to carry in the handbag for quick touch-ups, anywhere, anytime. 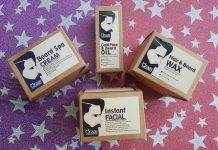 It is specially tailored for sensitive body parts such as upper lip, side burns, eyebrows and bikini lines. 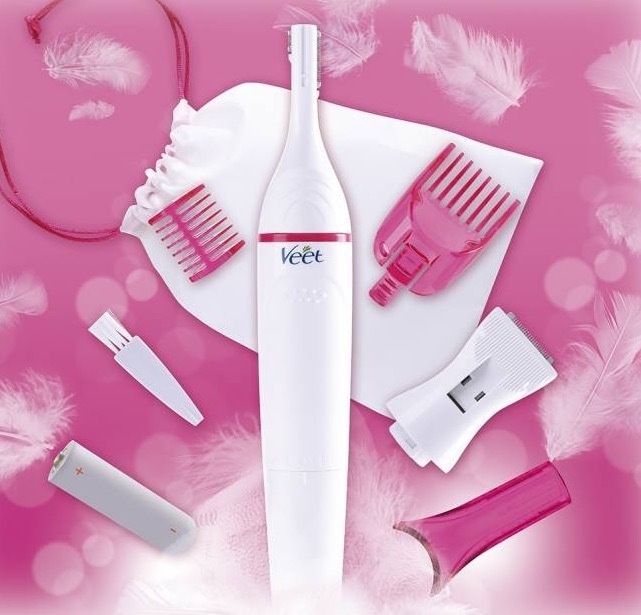 It removes hair gently and there is no fear of cuts as its cutting blade has no direct contact with the skin. Dedicated accessories are provided for precise shaping and styling of different parts of the body. The parts are water rinse-able. 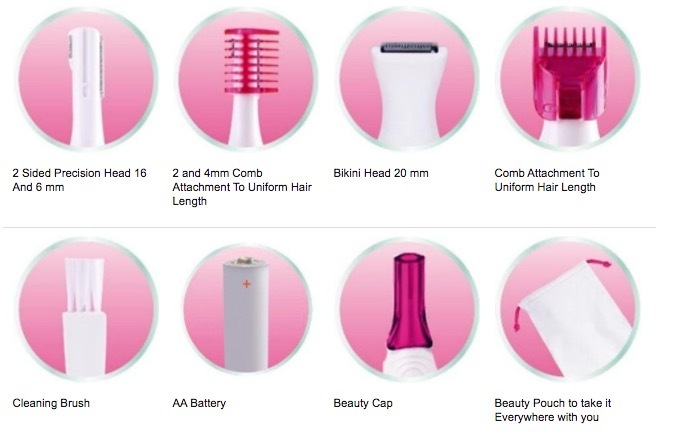 The package includes 1 precision head, 1 bikini head, 2 combs, 1 beauty cap, 1 cleaning brush, 1 beauty pouch and AA battery. Q. 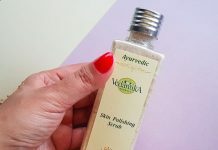 Is Veet Sensitive Precision gentle? A. Veet Sensitive Precision is gentle as its cutting blade don’t touch the skin so no fear of cuts. Q. How long will the blades last? A. There is a 2-year warranty on the device which includes the blade. The warranty starts at point of sale. Q. Should I need any pre or post treatment with the use of Sensitive Precision? A. As Veet Sensitive Precision is gentle, it doesn’t require any pre or post treatment. Q. 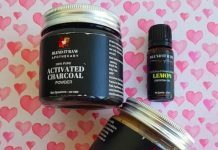 How do I clean the product? A. There is a cleaning brush supplied with the device to clean the blades. Both the bikini and face heads can be rinsed in water for cleaning, then wiped dry. You mustn’t rinse the main body in water. Q. Can I use the trimmer under the shower? A. No. The trimming heads of the device are ‘water rinseable’. The body of the device is not designed to be rinsed and should be kept away from water. So, it shouldn’t be used in the shower/bath. Q. Is it possible that one trims too much and as a result there are gaps in the eye brows? 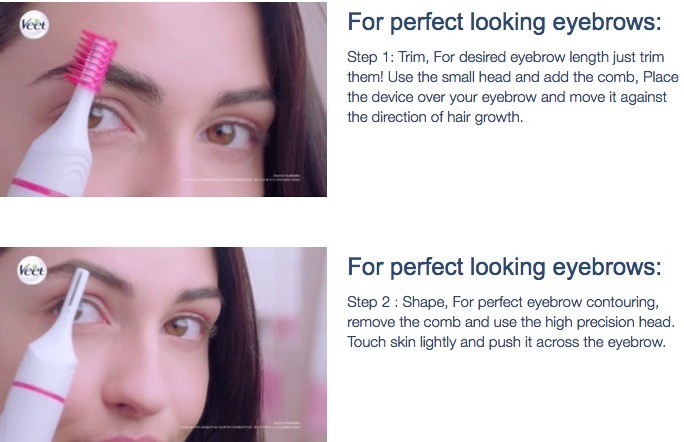 A.The Veet Sensitive Precision Electric Trimmer is a precision device which allows exact placement when trimming the eyebrows. 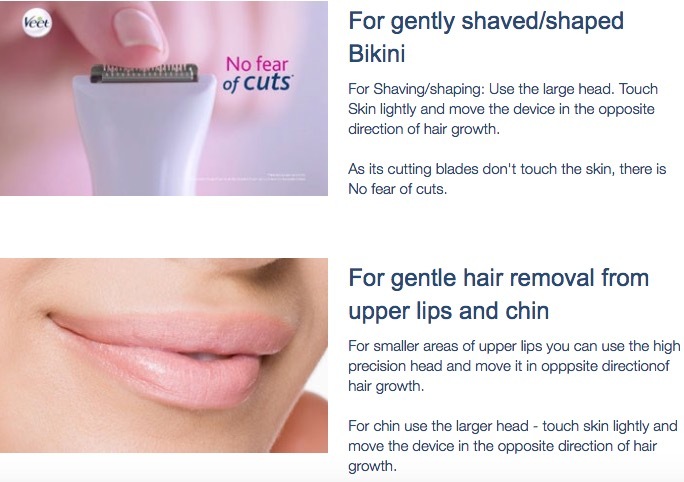 As with all shaving/trimming devices it is possible to cut a gap in the eyebrows but the risk is minimized by the easy to use precision cutting head.